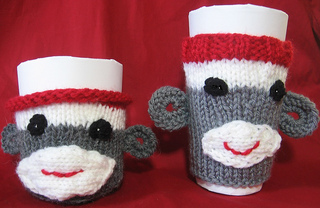 Classic Monkey Cosy for your COFFEE/TEA take-out cup! Protect your hands and keep the heat in the cup. Cute ears! Pattern can be worked on straight needles and seamed, or in the round on dpn’s, magic loop, or 2 circulars. Simple embroidered embellishments or use buttons for eyes. Sized for S, M, L-XL take-out cups, easily adapted. Ribbed top or straight stockinette choices. Sewing--running stitch, simple joining and adding pieces with backstitch and whipstitch (ears and mouth). These can be made in an hour!